It was here on June 6, 2015 that everything started, Choco & Nut opened the doors to the public in love with Nutella and since then the house continues to meet thousands of people with the same passion and friendliness ever. Faro is the heart of Choco & Nut, located in front of the bus terminal serves Portuguese natives to all the people of the world. Being the first Choco & Nut is called mother house by our chocolovers and just like a mother's heart, there is always room for one more. Friday: 2:00 p.m. to 1:00 p.m.
On April 12 our second store opened, located in front of the marina, with an incredible view and with a friendly and well-prepared team. The architecture of the house was planned so that our customers would feel more at ease and enjoy the spirit of Choco & Nut. A space with color and comfort, ready to be received by our Chocolovers. Thursday: 2:00 p.m. to 11:00 p.m. It was on September 14, 2017 that Cacilhas saw the birth of our Choco & nut. Between smiles, charisma, dedication and many sweet things we have conquered and changed our Almadenses. We are more than chocolate lovers - and of Nutella in particular - we are great lovers of smiles smeared, lusts of powdered sugar and we passed certificates of happy bellies. What are you waiting for? Come to Cacilhas and go out with Choconut in the heart. The month of November was ending and the rustle of the last preparations for the beginning of our Choco&Nut life was coming. On December 1st Portimão welcomed us .. With a smile on his face and a heart full of love to give, we welcome our clients. With all our dedication we conquer the nutella lovers. We become a family of greedy people, we receive many greedy families who come looking for a moment of sweetness in their lives! Yes it is!! We managed to conquer them with our wonderful and delicious dishes full of colors and flavors ... with all our dedication and ambition we built Choco& Nut Portimão! What are dreams made of? Love, dedication and nutella! We are kisses of sugar, chills of ice cream, and crazes sweeter than chocolate: since November 25, 2017 that Évora let himself be conquered by Choco & nut. Spreading happiness is our motto, and you? You are our "phenomenal ingredient"! What are you waiting for? 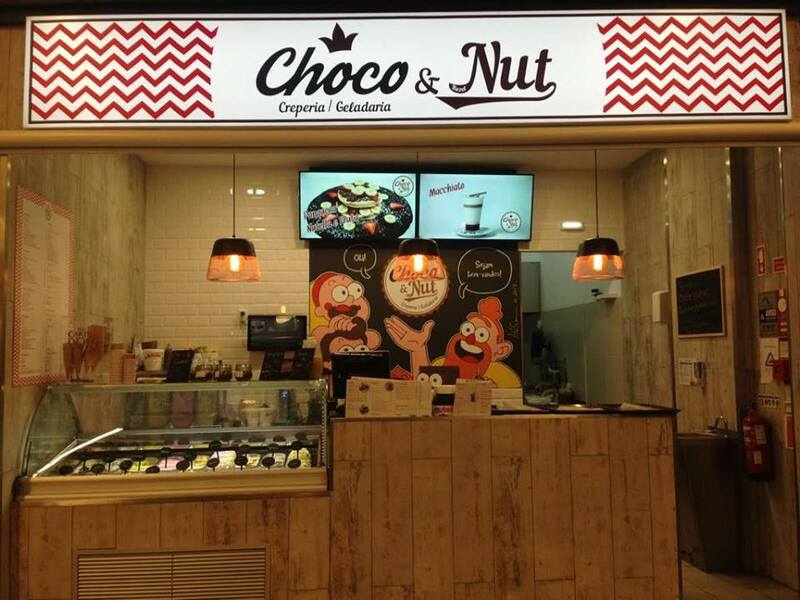 Your smile is ready to deliver, at Choco&Nut Évora Plaza! every day from 10 a.m. to 11 p.m.